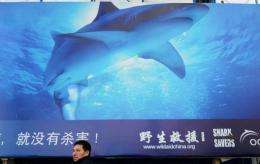 A pedestrian walking past a billboard bringing awareness to shark conservation in Beijing in 2010. The Bahamas on Tuesday announced a ban on shark fishing, becoming the latest country to protect the ancient sea predator which is considered at risk due to demand for its fins in Chinese cuisine. The Atlantic Ocean archipelago said it was banning the commercial fishing of sharks in its 243,000 square miles (630,000 square kilometers) of water, along with the sale, import or export of shark products. "People say, 'Why are you supporting sharks? They just eat people and eat other fish.' But in fact there's a lot more to sharks than that," said Neil McKinney, president of the Bahamas National Trust, which manages the country's resources. "They desperately need protection if we're not going to drive them to extinction," he told reporters in the capital Nassau, pointing to the "extremely important" role that sharks play in balancing the ecosystem. The US-based Pew Environment group has campaigned around the world to encourage shark protection. Before The Bahamas, Honduras, Maldives and Palau have also declared sanctuaries for sharks. Environmentalists say that around 73 million sharks are killed each year, generally by hacking off their fins, which can fetch lucrative prices as they are served in Chinese soups as a delicacy. The Bahamas counts tourism as a major industry and a recent study found that shark diving was already worth $80 million a year, a figure the government hopes will rise once the ban comes into force. The Bahamas in 1993 banned long-line fishing, which has largely prevented shark fishing. But no specific law prohibited the commercial killing of sharks and environmentalists pressed for action after a seafood company last year said it would start catching the predator for export. "The Bahamas remains one of the few location in the world where we have a relatively healthy shark population and a great diversity of species still exists, which is important if we're going to keep that population and if they're going to replenish other areas," McKinney said. California is considering imposing a ban on shark fin sales, which activists hope would have a major effect due to the state's large Chinese American population.